I’ve been asked (and privileged) to give a brief, short talk tomorrow in northwestern North Dakota on how to identify stone circles (often called tipi rings) and stone cairns. I will open by chatting about what meaning stone circles and cairns have to my friends, and I’ll probably mention a great friend Dakota Goodhouse, and one of his great-great uncles, Rain-in-the-Face (this is a magnificent attention getter by the way). Unsolicited universal observation: one doesn’t have to be within the halls of the academy or in a college or university to learn and teach. I kind of think of the world as a conversational classroom and lectern. It is only formalized when we’re in said classroom. Okay. That’s all. Carry on. Since it is snowing now and we’re bracing for a blizzard on the northern Steppes of North America, it seems appropriate to look at and unpack the Dakota word for these storm systems. Dakota, after all, was one of the original languages of the Dakotas and Minnesota. Blizzard in Dakota is icamnatanka, prounced roughly as ih-cha-mnah-tan-ka. In the case of icamnatanka, the word is a combination of two slightly smaller Dakota words. The first is icamna, which means “to blow, bluster, storm, drive, as wind and snow.” Mna in the word icamna is related to yumna. The yu in yumna expresses causation in some way. Thus the entire word yumna denotes a causation that means to rip a seam with scissors, or to rip a seam in anyway by pulling. The second word in icamnatanka might be a bit more familiar. The word tanka means large or great. It is easy by now to see how icamnatanka comes to denote blizzard. It is a large or great blowing, blustering storm driven by wind. And mna is a word also connected to ripping at the seams. If we use our historical imaginations, we can envision a Dakota, Lakota or Nakota on the northern Great Plains in what we know today as early December. When an icamnatanka would strike, this blizzard would indeed bluster and blow snow through or rip at any kind of seam, whether in a tipi, earth lodge or through the seam of a hide-garment. I posted a short version of this to social media the other day and a good friend, Dakota Goodhouse, texted me and said, “The Lakota use ichamna for snow storm or blizzard too, but use Iwoblu for severe blizzard.” The variations in language are mind-blowing. In the paraphrased words of John K. Cox at North Dakota State University, to learn a second language means that one learns to grow the other half of their brain. This is true. Anyhow, as I continue the joyous struggle to learn second languages, it has always seemed to make more sense to me when individual words are unpacked. And by “joyous struggle” I mean just that: learning languages, at least for myself, is difficult. But I’m up for the task. To understand another word and language is to begin to understand another culture. Language is so very connected to culture, and is the way a culture describes itself, immediate surroundings, and the world. When one opens a language they open up a new way of seeing yesteryear, today, and even tomorrow. The unpacking of icamnatanka came by way of help from one of Clifford Canku‘s Dakota Language I worksheets, and A Dakota-English Dictionary by Stephen R. Riggs (Minnesota Historical Society Press, 1992). Riggs started developing the dictionary in the 1830s with Samuel W. and Gideon H. Pond, and Thomas S. Williamson. They worked directly with Michael Renville, David Grey Cloud, James Garvie, and Walking Elk, a Yankton tribal leader. This blog entry has been cross-posted at North Dakota State University’s Center for Heritage Renewal here and here. Chapter 4 of “The Year the Stars Fell: Lakota Winter Counts at the Smithsonian” (2007). In the last couple days, Dakota Goodhouse (his blog, which you’ll want to visit, linked here) and I have been hanging out in downtown Fargo, as he’s in town to expand on the Native tradition of winter counts. He crashed at my place for a couple nights, and last night we had dinner over here after his short talk at the Spirit Room (this was organized and funded through a collaboration between the Fargo-West Fargo Public Schools Indian Education program and the North Dakota Humanities Council). Dakota and I chatted more about winter counts, and about future prospects of scholarly interest and inquiry. I’m thinking that winter counts, and the history of them, have become popular enough that I don’t really need to explain them. But just in case, a winter count is an annual pictograph painted onto the larger medium of buffalo or elk hides. In the latter part of the 19th century, they were painted onto canvas. These counts provided the owner or memory group with a traceable past, the pictograph often representative of a successful high-point of that year. 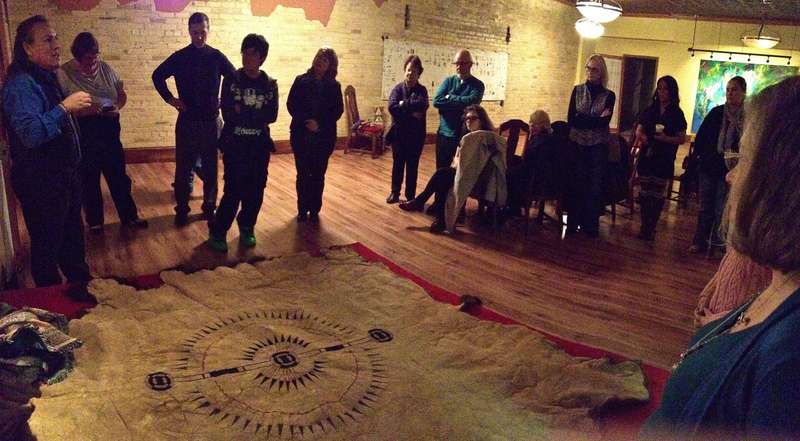 Dakota explains the stories reflected by and attached to the pictographs on the bison hide. While Dakota explained the winter counts to the group at the Spirit Room last night, he pointed to one of his buffalo hides while expanding on how he saw something different in that particular account. This particular account is a symmetrical series of triangles running around the circumference of a circle. Some years ago, Dakota said he used to think of this as a war bonnet laid out on the floor. Today, though, he said it also looks like the plains indigene narrative attached to what we call “sun dogs.” One of the stories that he knows is that the sun dogs are thought more of as camp fires next to the sun. These various stories got me thinking at least two related things that are slightly polemical. The first is something we deal with every now and then, and that’s one-dimensional thinkers who sometimes say, “Well, cultures with oral traditions don’t have a history, or if they do it’s impossible to trace.” This is always a fun question to respond to, but last night I was thinking more-so of how a person who reads a novel, or a good piece of history, are likely to walk away with a different perception about the same piece of scholarship within the span of two or more readings. A picture of Dakota being hilarious. This is similar to the winter count. Dakota explained the difference in how one individual, when looking at the bison robe laid out, might see a native headdress while another might see sun dogs, parhelia, or what the Dakota call wi’aceti, this roughly translated and defined as “when the sun makes fires.” Dakota added that the winters on the northern Great Plains are so cold that the sun requires camp fires to keep it warm. From here on out I decided to abandon the sun dog phrase and replace it with wi’aceti (pronounced, roughly, “we-ah-che-tee”). If anyone wants to join me on the northern Great Plains in this effort, by all means. If we hear someone say “sun dog,” please feel free to add wi’aceti to that, and with explanation. 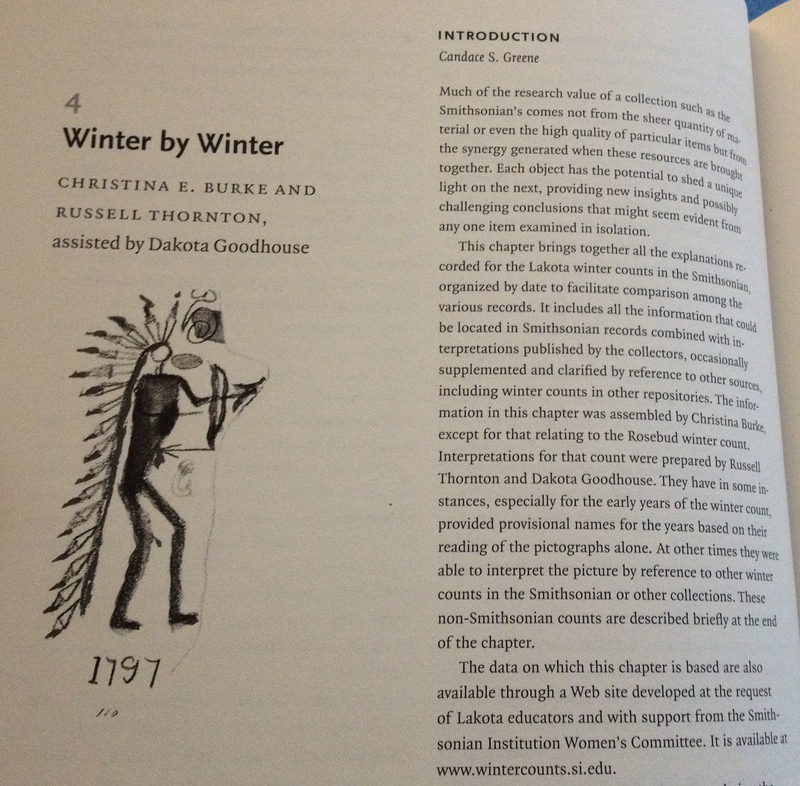 Also, Dakota contributed heavily to a piece of winter count scholarship that yo might be interested, chapter 4 of Candace Greene and Russell Thornton, The Year the Stars Fell: Lakota Winter Counts at the Smithsonian (Lincoln: U of Nebraska Press, 2007). Yesterday Philip Deloria visited one of my alma maters, the campus of University of North Dakota (Grand Forks). I had a chance to ride up from Fargo with good friend Dakota Goodhouse (he was on his way up from Bismarck), and we met with Phil for a short while that morning. 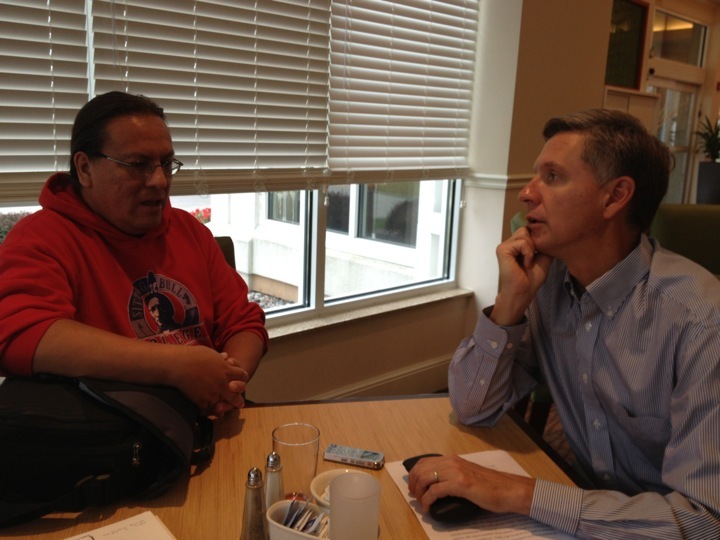 Dakota Goodhouse and Philip Deloria catch up a bit in Grand Forks, North Dakota. One of Phil’s ongoing projects has to do with the artwork of Mary Sully (1896-1963). Mary was from the Standing Rock Nation in the Dakotas, and Phil is analyzing a large body of artwork she produced throughout the course of her life. Mary did not leave behind any narratives of her art, so Phil is piecing together what he can, and contextualizing a lot of her work with the periods in which it was produced. This reminded me a bit of that general rule of history, that all historical figures influence and are influenced by the times and places they occupy (context, context, context!). 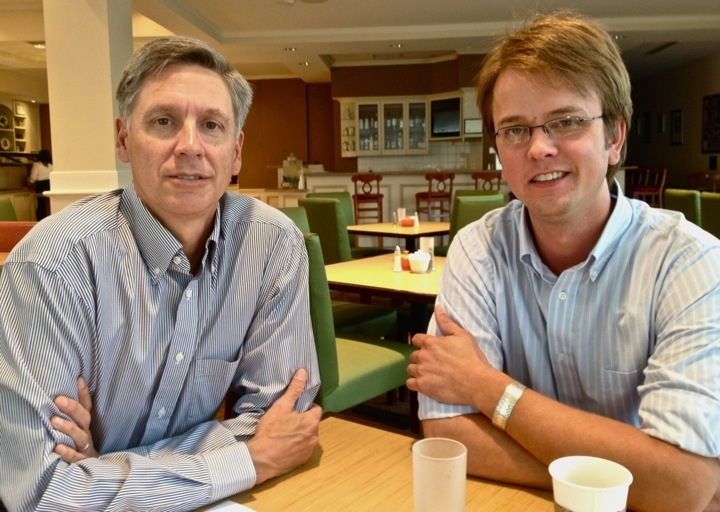 Prior to his talk at noon, Dakota and I chatted with Phil over coffee. In every sense of the classic phrase, he is both a gentleman and a scholar. It was quite interesting to hear about how the grandfathers of Dakota and Phil kept up a correspondence throughout the course of their lifetimes, too. Today, Dakota and Philip continue that correspondence. And another note: Phil is a great, great, great, great grandson of General Alfred Sully (I may have one too many or few “greats” in their). One year, Sully took a Native Dakota wife while on the northern Great Plains. Children resulted from that, and so did grandchildren. History has an infinite number of connections with the present, as it should: the reason we are here is because of yesteryear. Cool stuff. Also, check out Philip’s scholarship here and here and here. And definitely check out his late father’s scholarship, too, Vine Deloria, Jr., here, here, and here (this is just a cursory sampling of Vine’s body of work). Phil Deloria and myself, after asking Dakota to snap this photo. Taken on September 18, 2013. 3 p.m. Speaker Panel – Preservation of Whitestone Hill – Past, Present and Future. Alden Flakoll, Board member of the Whitestone Hill Battlefield Historical Society, Dakota Goodhouse, Program Director for North Dakota Humanities Council, Ladonna Allard, Tourism Director for Standing Rock Reservation, Tamara St. John, Tribal Historian for Sisseton Wahpeton Tribal Historic Preservation Office, Diane Rogness, Historic Sites Manager for the State Historical Society of North Dakota. 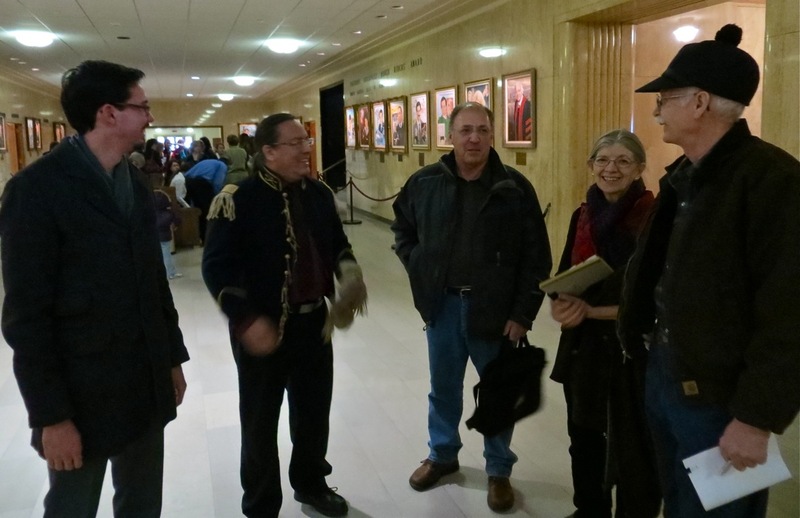 Individuals concerned about what happens to the Killdeer Mountains chat before the public hearing at the Bismarck capitol on January 24, 2013. The Killdeer Mountains in Dunn County, western North Dakota have been getting a lot of attention lately, especially after the North Dakota Industrial Commission decided to, well, industrialize the area, and allow the Hess Corporation to follow through with signed leases and drill and frack for oil there. The Grand Forks Herald reported on it here, and The Bismarck Tribune here. The Industrial Commission is composed of three individuals, including Jack Dalrymple, Wayne Stenehjem, and Doug Goehring. They have scheduled meetings with the Department of Mineral Resources and Lynn Helms, the sitting Director. It is important to remember that this was a public hearing, and at public hearings the public ought not to be shy about attending. This experiment America has going, our Democratic-Republic, necessitates these local meetings that have global implications. 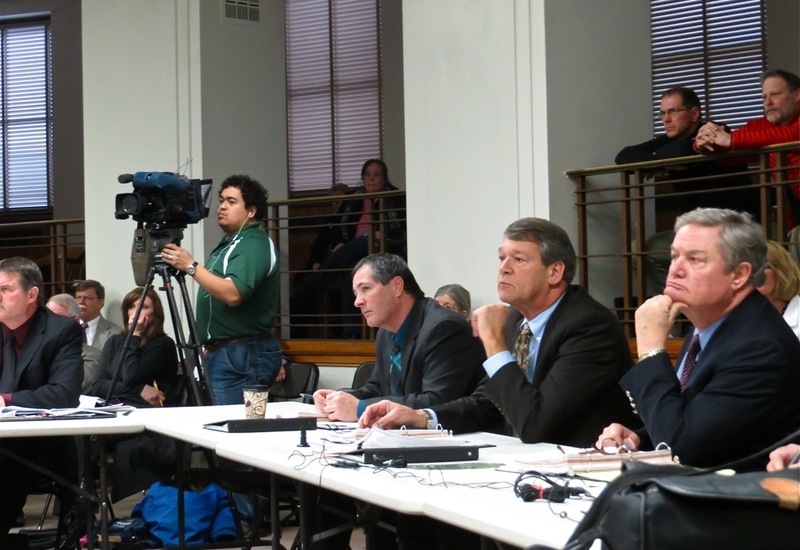 On January 24, 2013, at 1:00pm (CST) the public hearing for the Killdeer Mountains was held in the capitol of Bismarck, North Dakota. It was Industrial Commission Case Number 18618 concerning sections 25 & 36, T. 146 N., R. 97 W, this about 30-35 miles north of Dickinson, North Dakota. Originally the hearing was scheduled in the Governor’s meeting room, a rather closed-off and secluded place. Because of the public turn-out, though, the hearing was relocated to the larger Brynhild Haugland room in the western wing of the capitol. I drove over from Fargo to Bismarck to attend the meeting, and while there scribbled down some notes and took some audio-video as well. The high-points, I thought, were in capturing two Native voices from two disparate cultures. The first is a video from Theodora Birdbear of Mandaree, North Dakota (Mandaree is Mandan, Hidatsa and Arikara territory). The microphone on my Canon PowerShot SX260 HS captured the audio a bit, and just in case there are those of us hard-of-hearing, I provided transcript of Theodora’s testimony below. …and he expressed the impact of oil and gas development, the industrialization of an area, which impacts the quality of that spiritual experience. I guess it’s kind of equivalent to having an oil well right beside your Catholic church or something. It’s parallel to that. So I wanted the commission to know that Fort Berthold does have a living connection to that area, and to consider that in your decision making. As people have said prior to this, technology is evolving, and to keep it [oil] in the ground is not wasting it. They are going to be after it in the future. What’s the rush? The rush is quick decisions, unplanned decisions, and unplanned impacts. So I just wanted to make a comment about our relationship with that area. It is still living today. North Dakota Industrial Commissioners listen to Natives speak about the sacredness and history of the Killdeer Mountains. Theodora remarks on how the Killdeer Mountains are a sanctuary, as sacred and sacrosanct as a Catholic Church, and to carry the analogy further, as a Lutheran or protestant church, a Synagogue, a Mosque, a Buddhist monastery, a Hindu temple, a Confucian temple, and so on. These spaces are sacrosanct in the sense that when an individual goes to the area to pray, they are really interested in having it as quiet. A library could also be considered a sacred space by this definition (libraries carry on that monastic-academic tradition of the deliberate contemplation of texts — this is arguably the antithesis of our hyper-industrial, full-throttle, 21st century world). 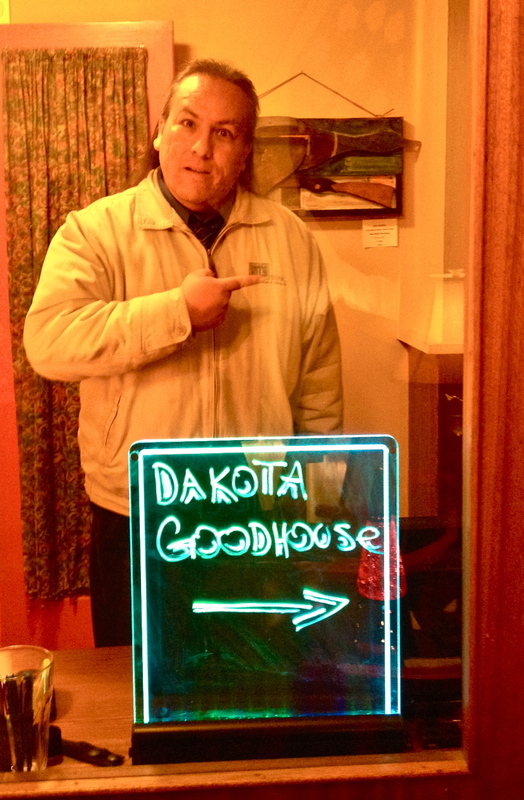 The other Native voice captured came by way of Dakota Goodhouse, who originally hails from the Standing Rock Sioux Reservation in south-central North Dakota (he shares the namesake of the state, which in English means ally or friend). Dakota gives some backdrop about the history of Killdeer Mountains as it pertains to the US-Dakota Wars, specifically the punitive campaigns carried out by General Alfred Sully west of the Missouri River circa 1864. For some video context, Dakota is speaking and Lynn Helms is seated at the right. In this video excerpt, Dakota is remarking on how the encampment and battle boundaries are much larger and broader than what is delineated now (as of 01/25/2013), and how they need to be re-considered.